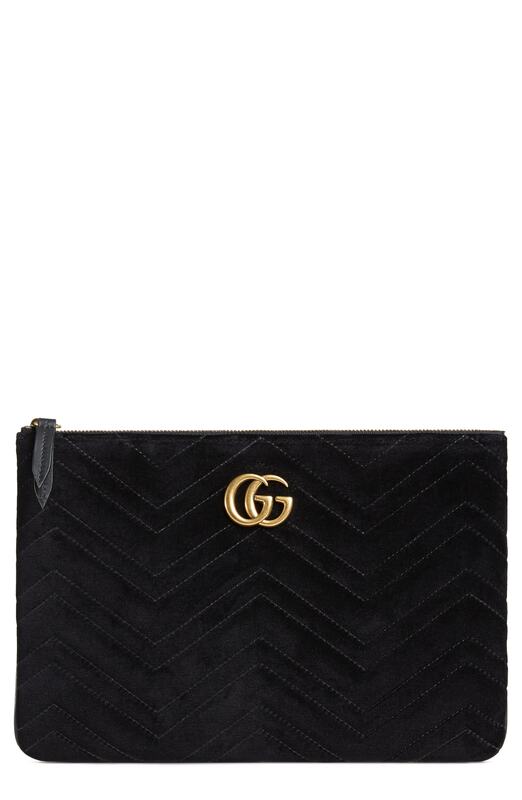 Opt for a black sequin tank and a Gucci gg marmont 20 matelasse velvet pouch for a trendy and easy going look. Dress in a black fur jacket and a Gucci gg marmont 20 matelasse velvet pouch, if you want to dress for comfort without looking like a slob. You could perhaps get a little creative in the footwear department and lift up your outfit with red suede pumps. If you're obsessed with relaxed dressing when it comes to fashion, you'll love this super cute combination of a white button down blouse and a Gucci gg marmont 20 matelasse velvet pouch from Nordstrom. Bring instant interest and excitement to your getup with red suede pumps. We all outfit for comfort when it comes to dressing up, and this combination of a yellow coat and a Gucci gg marmont 20 matelasse velvet pouch is an amazing example of that. If you're obsessed with comfort dressing when it comes to fashion, you'll love this extra cute combination of a pink floral long sleeve t-shirt and a Gucci gg marmont 20 matelasse velvet pouch. Amp up the cool of your look by rounding it off with red suede heeled sandals. Pair a red satin cami dress with a Gucci gg marmont 20 matelasse velvet pouch from Nordstrom if you're after an outfit idea for when you want to look casually cool. Kick up the cool of your look by rounding it off with silver sequin ankle boots. We all want comfort when it comes to dressing up, and this combination of a grey embellished evening dress and a Gucci gg marmont 20 matelasse velvet pouch is a practical illustration of that. Make a beige lace long sleeve blouse and a Gucci gg marmont 20 matelasse velvet pouch your outfit choice, if you want to dress for comfort without looking like a hobo. And if you want to instantly up the style ante of your look with one piece, enter beige leather pumps into the equation. If you love staying-in clothes which are stylish enough to wear out, consider this combination of a black quilted leather biker jacket and a Gucci gg marmont 20 matelasse velvet pouch from Nordstrom. To add oomph to your ensemble, complete with black and white leather platform loafers.